When moving between Spain and the UK, many people will consider hiring a van and driving themselves and their belongings to Spain � and while it might seem an appealing option, it can present a number of problems. One of the most common issues is with police traps throughout France and Spain. Less experienced drivers might find themselves accidentally experiencing trouble, whereas those with experience will know exactly how to avoid and deal with them. Often, police wait at toll boots and other junctions with weight pads, pulling vans over to check that they haven�t gone over the legal weight limit. If you are overweight, you�ll be fined an amount that could be as much as 4000 Euros. If the fine alone weren�t bad enough, you�re expected to pay it in cash at the roadside, and then to offload your excess weight before moving on. Understanding the complex rules about weights and loads for a removals van from Spain to UK can literally save you thousands. Another roadblock you might encounter is drugs searches � this will involve unloading your entire van to be checked by sniffer dog, and then packing it all again by the roadside. Without experience you could lose time, money, and even some of your belongings. 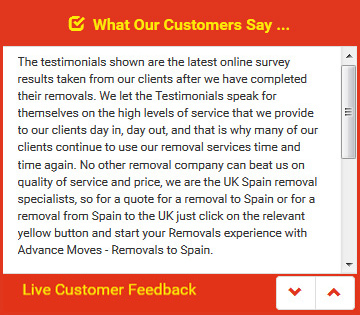 Advance Moves understands every aspect of one way van rental from UK to Spain, or Spain to the UK. We offer a range of packages to suit all needs, and our Quick Quote system will allow you to accurately budget for your move.